Posture Trainer™ | Improve Your Posture | Posture Correction - Halo Posture Inc.
Read Dr. Michael Bucknell's Article "Posture's New Ally"
The Posture Trainer™ was specifically designed to support the upper thoracic spine as well as promote improved curvature of the cervical spine. This product has proven to be safe, easy to use, affordable and most importantly, effective. The Posture Trainer is recommended for patients who exhibit a combination of poor upper body (rolled shoulders) and forward head posture. 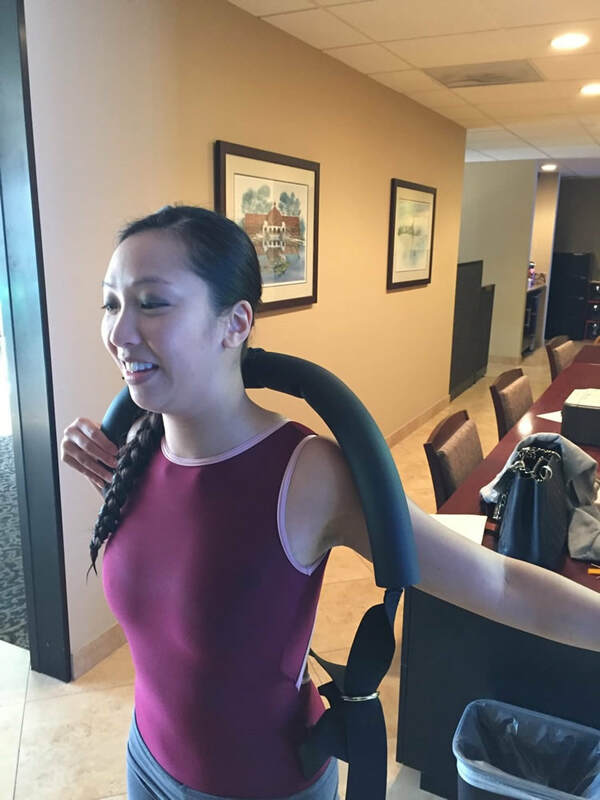 The Posture Trainer is intended to be used in conjunction with the Halo Posture head weights for maximum effectiveness in treating upper thoracic and forward head posture. Why the Posture Trainer ? While there are an array of posture improving products and exercises on the market, the Posture Trainer is unique in that it provides dual support (upper back and neck) and incites active recruitment of the small twitch muscles which are responsible for retraining the larger postural muscles which support the spine. The unique design of the PT allows the wearer to sit, walk, run or workout comfortably for extended periods of time. How do we know it works ? Dr. Michael Bucknell developed the Posture Trainer and has documented his patients pre and post results through digital motion x-ray. 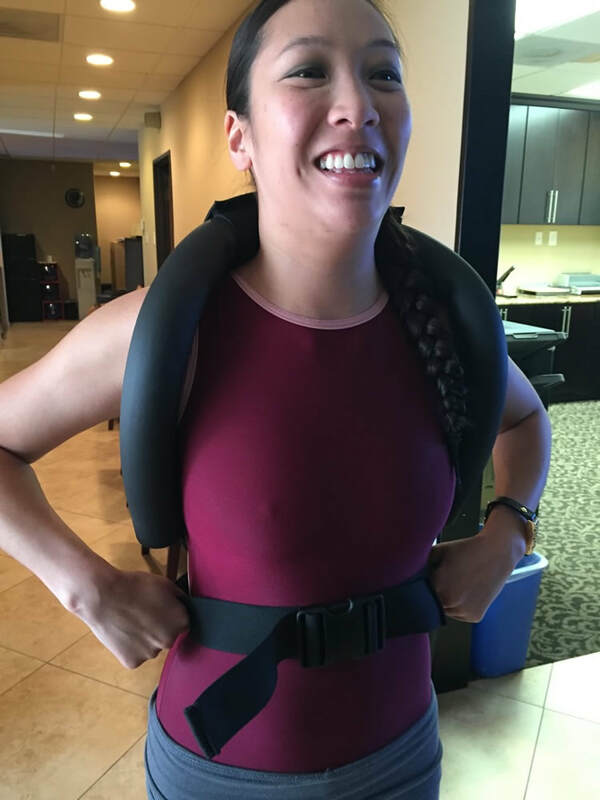 From Dr. Bucknell: “We have been testing the Posture Trainer in combination with head weights since early 2015 on our DMX. Some of these studies can be seen at Facebook.com/InnateInnovations. We always test the weights after patient adaptation by having them adjusted, walk around, then go through flexion and extension before capturing the adapted still images seen. The overwhelmingly majority of patients respond best as predicted to the combination of a Halo Posture head weight and Posture Trainer. The Posture Trainer should be worn for five to ten minutes daily for one week. If the wearer does not experience any unusual or immediate discomfort, daily use should be increased by ten minutes per week. Ultimately, the wearer should be able to use the Posture Trainer for several hours of ADL(activities of daily living). Should the wearer experience sudden or unusual pain during the course of use, immediately discontinue use of this product and seek immediate medical attention from a licensed Health Care Practioner. 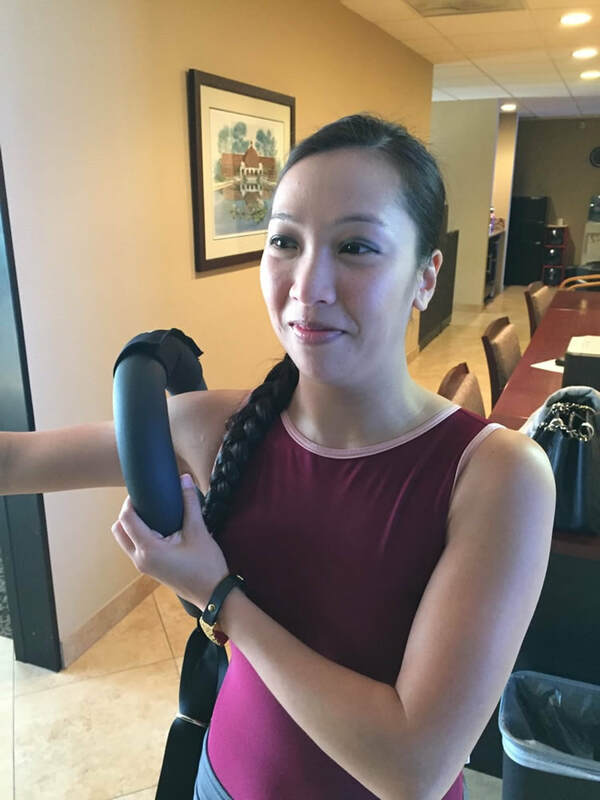 While holding the Posture Trainer in your hands, be sure that the “Halo Posture” logo located on the protective cover which rests on the users neck. Proceed to put the PT on as you would a backpack. Once the PT is on, look in a mirror to insure that the protective neck cover is centered on the back of your neck. Now locate the elastic waist straps and bring the buckle and insert clip around to the front of your waist (the female clip should be in your left hand and male clip in the right hand). Proceed to insert the male clip into the female clip. To insure a comfortable fit, be sure that the elastic waist straps (where fed through the silver ring) appear as in the photo. Now proceed to adjust the PT foam tubes which travel under the armpits so that they are snug then reach back with both hands and firmly grasp the elastic waist bands just below the silver ring and pull the elastic waist bands forward. Then adjust the tension of the waist bands by pulling on the ends of the waistbands.